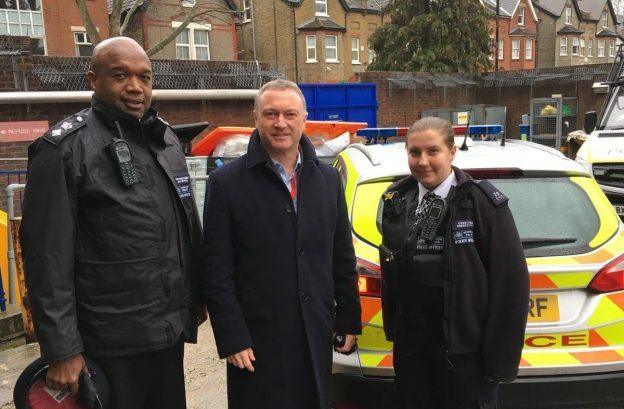 Croydon has a new police chief, and Steve Reed MP wasted no time inviting him for a walk-about to discuss local concerns about crime and how they can be tackled. Chief Superintendent Jeff Boothe and Steve Reed MP joined neighbourhood police officers to talk to residents in Thornton Heath and Upper Norwood. Steve discussed problems including fly tipping and dumped rubbish, gang crime, burglary, domestic violence, and the high number of children in care in Croydon who go missing. Before setting off, Chief Superintendent Boothe showed Steve the police’s new body-worn cameras that will soon be carried by all police in Croydon. The cameras help police gather evidence more quickly and also show that officers are carrying out their duties appropriately if challenged.